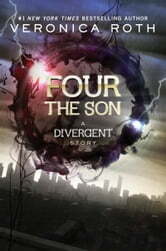 Four The Son ( a divergent story). A very short chapter When I spend money on a book I expect to get books !,,,,,,, ,!, Max a faction leader four now a Daunless member can not be taken from him at sixteen is a natural leader. As Dauntless leader he would have to come face to face with his father. To change they must more enthusiasm, have to be stronger, braver, better than they were now. At meeting his dead mother he is having not regrets of his choice of faction be he is a combomation of them all. Really good read. Wanted it to be longer but was good. Read all the divergent series. Loved them all. The short story is well written and helps you understand more Four and what he went through before he joined Dauntless. It contributes to the understanding of the time before the Divergent series started it lacks drama or emotion. The shortest of the four books. Still a very good read. I can't really talk about what part of Four's life this books covers as it would be considered spoilers... but I can say that in this book we discover more things on Four's family.